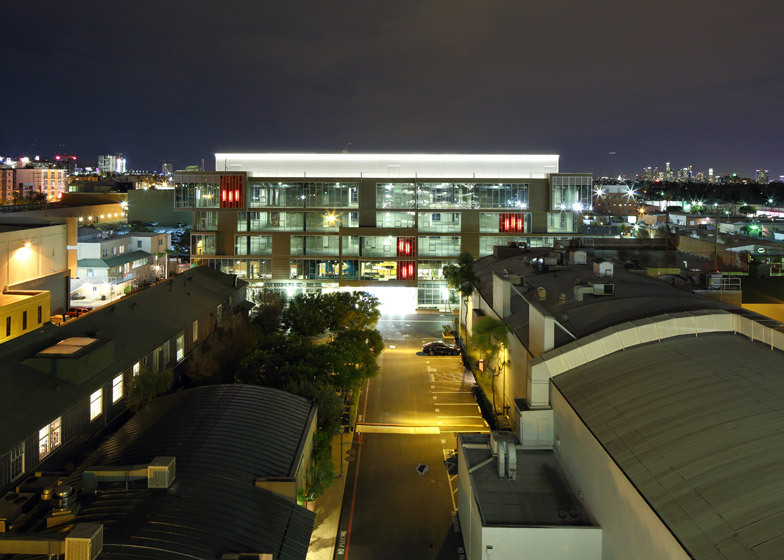 Los Angeles studio Clive Wilkinson Architects has designed the West Hollywood offices for comedy video production company Funny or Die, which double as a film studio (+ slideshow). 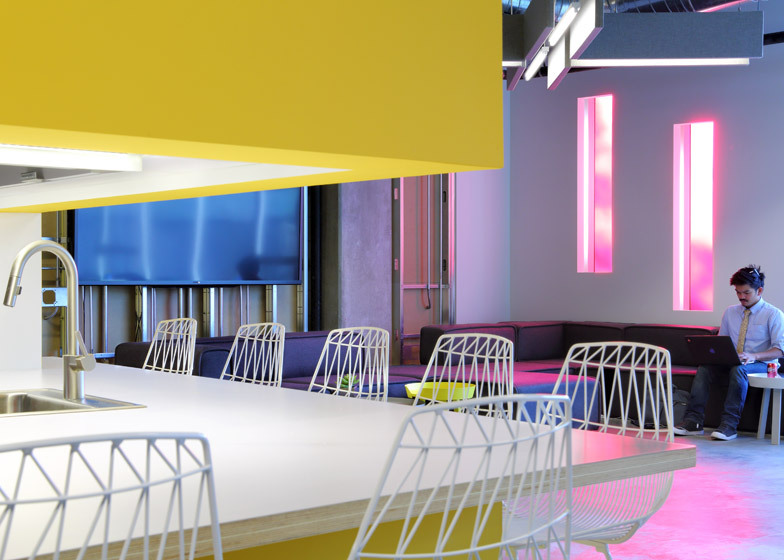 Located in a new office building, the interior by Clive Wilkinson Architects encompasses 2,300 square metres across two floors – bringing together Funny or Die, its parent company Gary Sanchez Productions and offshoot Gifted Youth under one roof. 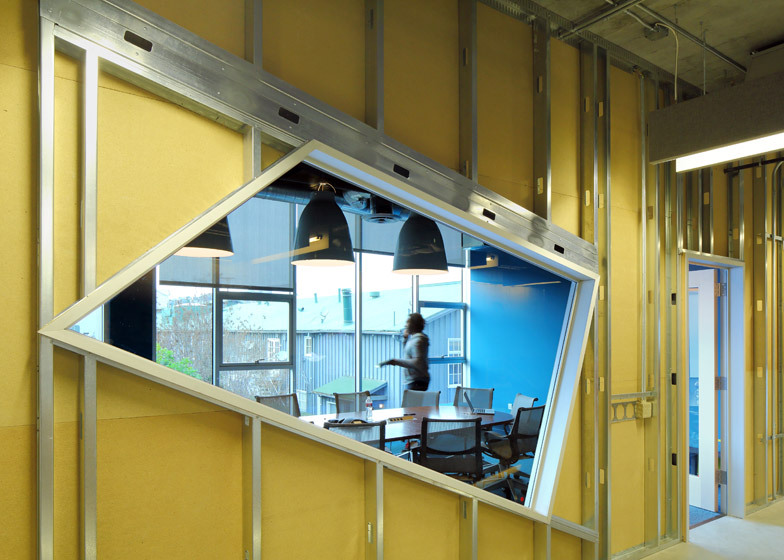 "With its success, the company had expanded considerably, resulting in the need for larger offices with more meeting, production, and storage space, and reflective of the company's vibrant personality and specialised departmental needs," said the architects. The whole office needed to serve as a film studio for the creation of video content, as well as include spaces for editing, office work and meetings. A large acoustically enhanced area acts as a stage, with a curved cyclorama wall for green-screen filming. Prop rooms, editing bays, sound booths, and hair and makeup areas are also dotted about the building. 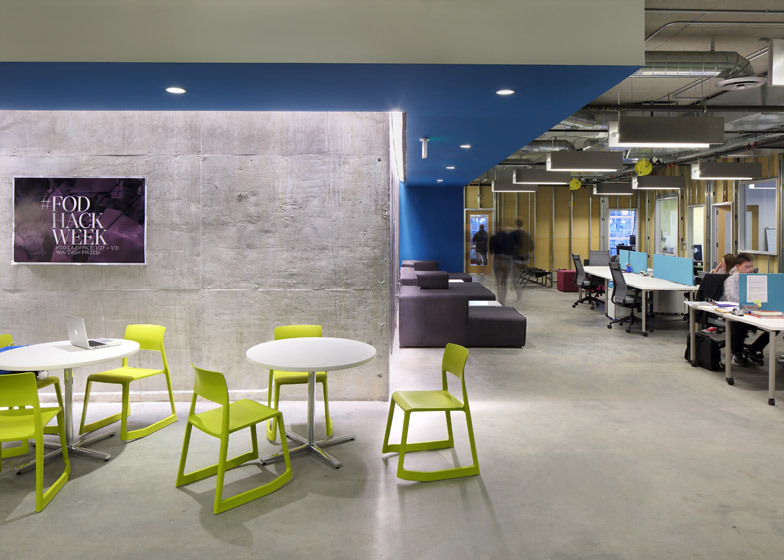 The design team opted for a "work in progress" aesthetic, exposing metal stud framing on partition walls and ductwork across the concrete ceiling. 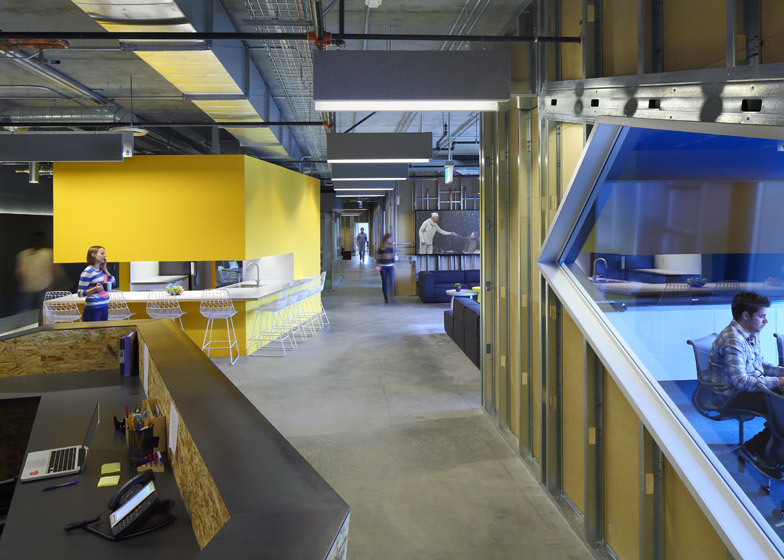 "Upon entry, illuminated exposed studs and peg board act as a visual nod to Funny or Die's scrappy startup mentality, a quirky rawness which continues throughout the office," the architects said. 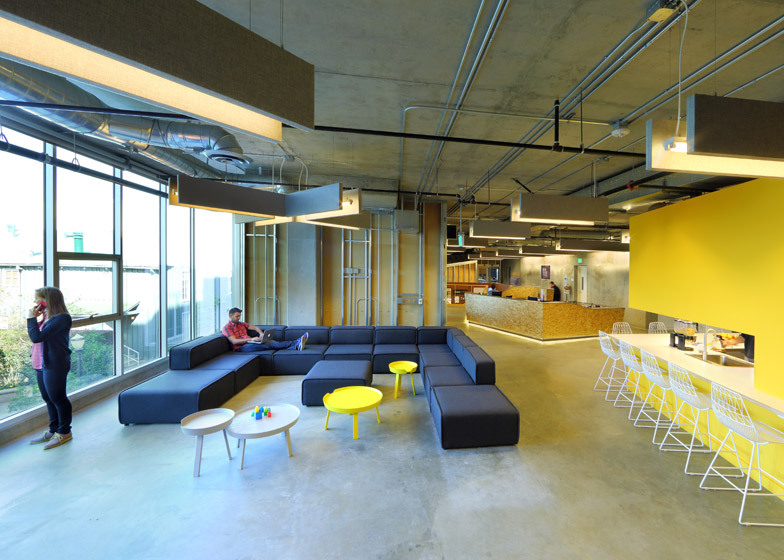 Concrete walls and floors are also left bare, contrasted with brightly coloured surfaces and furniture. Oriented strand board (OSB) clads reception desks on both floors and an astroturfed meeting room is surrounded by glass walls. Bar seats are positioned around a kitchen counter within a yellow block in the middle of the upper floor, which matches the central staircase. 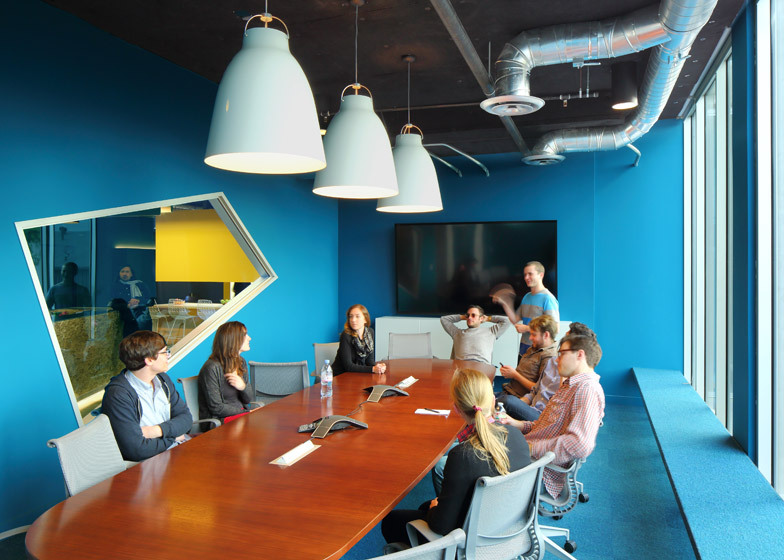 Bright blue meeting rooms and partitioned desk spaces around the perimeter of the floorplate also add colour. Lounge areas accommodate collaborative or more informal working areas, positioned beside floor-to-ceiling windows. 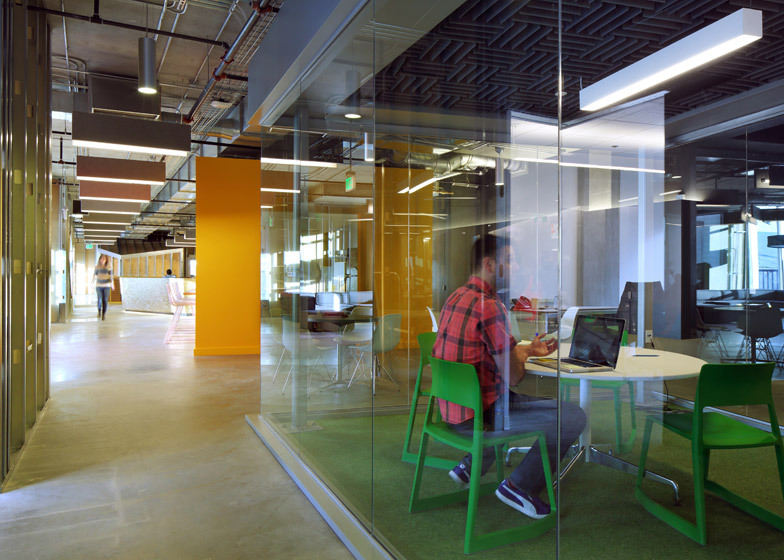 Clive Wilkinson – who also designed the offices for a motocross apparel company in California – told Dezeen about how he convinced Google to move away from "humiliating, disenfranchising and isolating" workers' cubicles during an interview earlier this year.